Well, there are many ways to do this. Some people use a vittle vault or something similar while we prefer gamma seal lids on standard 12" buckets. Just be sure it's stored in an air-tight container and somewhere that is cool and dry. 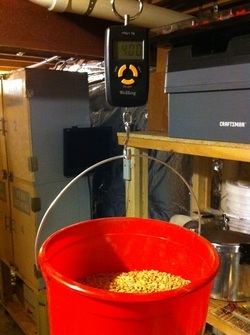 Weighing grain at home is easy. You can use a regular analog kitchen scale and weigh a few pounds at a time (like we used to) but this becomes tedious with larger grain bills. Consider buying a scale that can be hung from a stand or convenient floor joist nearby. All it takes is a nail, chain, and a carabiner or screw link to connect your scale. Both analog or digital scales work great. We use a cheap digital scale found online for $7. 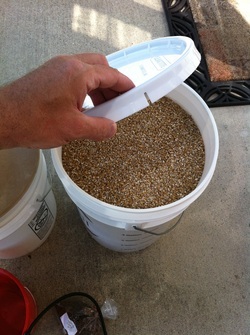 All we do is tare the weight of an empty bucket (a feature that accounts for its weight), then pour in the base malt. 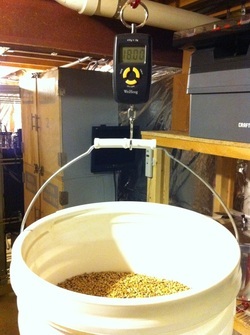 A smaller bucket comes in handy when weighing specialty grains. To mill or "crush" the grain, you'll need a barley mill with rollers that will expose the starch in the center of each kernel. These rollers are usually pre-set to a gap in the range of .035"-.039" which can be checked with a feeler gauge from the auto parts store. Measuring with a credit card will get you very close to .036" (.9mm) and this is perfect for BIAB since we are less concerned with how much flour is produced. If your setup is traditional all-grain, too fine of a crush can make lautering difficult and could lead to a stuck sparge. .038 is normally a good place to start. Most grain mills are made to fit on a 12" bucket (pictured left) or they can be mounted in a milling station like this. 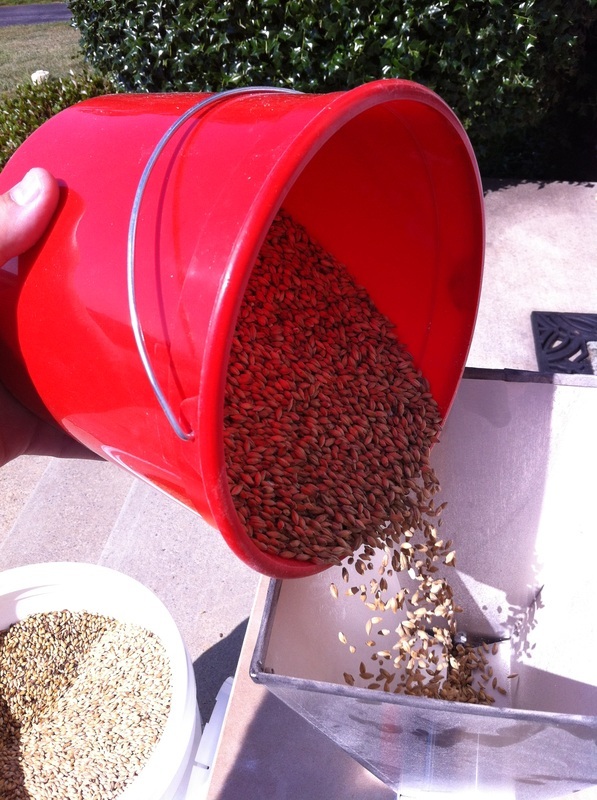 Whatever way you decide, milling grain produces a fair amount of dust so you may want to mill outside or maybe incorporate a vacuum in your setup. 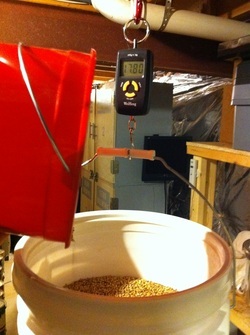 We use a barley crusher sold by Northern Brewer with a 7lb capacity hopper. This model comes with a handle to manually crush the grain. I guess this works, but we wouldn't know because it went in a box the day it arrived. Instead, a drill is attached to make this job as easy as possible. Pour in the grain and let her rip! The cordless drill pictured above is a bit low on torque and the grain must be poured slowly and deliberately or the drill will chatter and stop. I've since purchased an inexpensive Dewalt corded drill that is variable speed and chews through grain like gangbusters. I can finally start up the mill and load in as much grain as the hopper will hold! 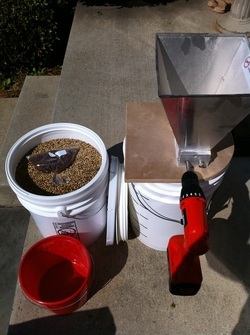 Finally, seal the bucket with a lid to keep the crushed grain fresh and any nasties out until you're ready to brew.